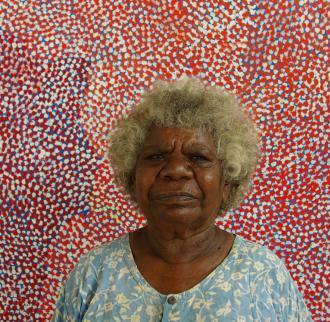 Nyangarni, of the Walmajarri language group was born at Wanywurtu under a tutujarti [desert walnut] tree. She grew up there with her family of one father, two mothers, one brother and two sisters. There is a rock hole with spring water at Wanywurtu where Nyangarni remembers going walkabout for goanna and pussycat [feral cat].